How do you motivate piano students? It seems like this is the question of the century and in a perfect world, every piano student would be intrinsically motivated. But, alas, as piano teachers, we wear the expert knowledge-holder hat, the creative artist hat, the event planner hat and the studio manager hat, just to name a few. And, we certainly have to wear the cheerleader hat as well. Finding just what makes every student in your studio tick is quite a task. Every student has their own unique strengths, challenges, interests, family situation and personality. All of these things add up to a studio full of individuals with their own set of motivational needs. Every piano teacher loves it when a student comes along who dutifully practices consistently with a great attitude and is eager to learn more things. But, even the best and most talented students are going to need a nudge from time to time. We’ve probably all been in the situation where bribing students with candy, stickers, toys and prizes seemed like the best way to get results. There certainly is a time and a place to tap into a child’s love for earning and having something tangible. 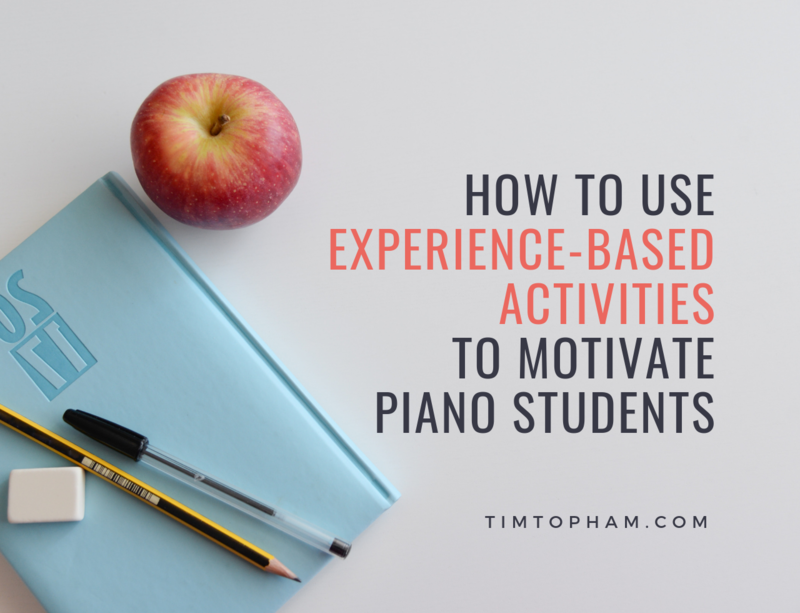 But, let’s also consider non-material, experienced-based rewards to motivate piano students. We can all use an extra dose of delayed gratification and these more long-term rewards teach your students to keep their eyes on the prize. These are the type of things that you can create a big hype within your studio by getting your students excited for something really special that they can work towards. Doing this will strengthen the community within your studio. It will get your students talking and they’ll know that they’re all working towards the same goal. First, let’s brainstorm some types of non-material rewards students could earn, then we’ll talk about ways they could earn them. The offer could be the opportunity to attend a special party just for the top practicers. Any type of party would do the trick: a pizza party, a popcorn party, a cookie baking or decorating party, a movie party, an ice cream party a craft-making party. It doesn’t have to be a long party, but just enough time to make your students understand that they did something to deserve something really special. As the teacher, I love having opportunities to visit with and get to know my students outside of our formal lesson time. A party reward is a win-win because it gives the students a really fun treat and it gives the teacher a chance to spend some personalized time with students. Just tread carefully, you don’t want some students to feel left out. Could offering your students to have a play on different instrument be a good way to motivate piano students? Sometimes piano lessons can feel really isolating. Students get tunnel vision and think that piano lessons are the only place where music-related things happen. They don’t always see the big picture of how relevant music is outside of your studio walls. Organizing a field trip for your students is the perfect way to broaden their musical horizons and help them see other applications of music. Take a trip to see a performance such as an orchestra, a musical or special event happening. Some orchestras have open rehearsals that students can sit in on. This is a perfect chance to teach your students about all the other instruments out there. A high school musical or community theatre performance is always fun and those groups would love to have a crowd of young music enthusiasts in the audience. Visit your local music store. Local music stores would love to have a group of potential customers come to visit and they have all kinds of educational opportunities. Perhaps the piano sales department would be willing to demonstrate the differences between grand pianos, uprights and digital pianos. Maybe someone in the band department could let your students get up close to band instruments. You could spend some time in the sheet music department teaching your students how to find music at their level. Find local piano business and see if they have something to show your students. Last year, my students visited the workshop of a man who refurbished pianos. He had a piano completely taken apart. My students had a good look at all of the action of the piano and left with a clear understanding of how a piano works. It was a memorable experience that my students still talk about more than a year later. Visit the Apple Store. Did you know that the Apple Store is often willing to host groups of students for educational field trips? They have a couple of presentations that they can give students to help them learn how to apply their music skills when using GarageBand. There’s a good chance that most of your iPad loving students have no idea what to do with GarageBand, so this is a fantastic opportunity to get them using their iPad in a very productive and creative way. Visit a recording studio. See if a local recording studio would be willing to host your students to show them exactly how the recording process works. Let your students earn special privileges within your studio. This is a win-win because it requires no extra time or financial investment on your part and it creates a really fun experience for your students. Let your student be the teacher – they can choose what to do in their piano lesson (within reason!). Let your student have a games-only piano lesson. Give your student a chance to spend time with something special in your studio. In my studio, my students love to get their hands on my collection of Japanese Iwako puzzle erasers. They could take them apart and put them back together for a whole hour if I let them! My students love opportunities to draw on my dry eraser boards or even just to draw with markers and paper. You can certainly keep it educational by directing their creativity towards something musical. For example, they could illustrate a classical piece of music. Carnival Of The Animals, The Planets, and The Four Seasons are easy concepts for kids to work with. Or they could design their own picture that features as many musical symbols as possible. My students recently drew musical flower gardens with lovely flowers made from quarter notes and half notes and crescendo signs became flower stems. One drawing even had a displayed a thunderstorm with giant quarter rest as a lightning bolt. Let’s help motivate our piano students. Giving your students the opportunity to learn something outside the scope of their normal piano lessons makes for a really great reward. Not only does it keep your students engaged in learning their piano material but it also equips them with a new skill in the end. Creating CD or a playlist of their own recordings. Kids love hearing recordings of themselves playing the piano and it’s surprising how hard they will work to get a song ready for a recording. Since students love having something tangible, making a CD is a great outcome to work towards. Let your students design their own cover art. An inexpensive way to print professional-looking CD’s is to use a website called Kunaki. Since CDs and CD players are kind of on the way out, more recently my students have been satisfied recording their music to a USB drive. It’s an easier process and although it doesn’t result in the same flashy product as a CD with a fancy cover, it’s still a tangible way to share their music. Let kids create YouTube videos. With the parent’s permission, give your students a chance to make a really nice recording of them playing one of their favorite songs. If the parents opt out of YouTube, students will still be excited to have a video they can send to friends and family. Once again, students will understand they need to have a great performance on their video and they’ll almost always rise to the occasion and put forth the effort to get their video just right. If you have experience with another instrument, give your students a chance try it out. My students see my ukuleles in my studio each week and often want to try them out. 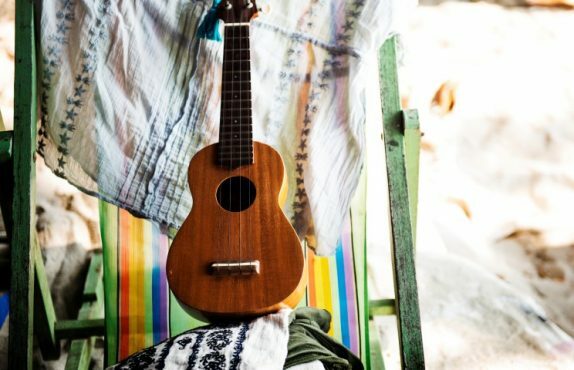 We could easily fill a lot of their lesson time playing around with a ukulele, but instead, I reserve it for special occasions. It’s a great motivator since it’s something that the students really want to know about. Let your student learn something a little different on the piano. Maybe they could spend a lesson browsing your music library and choosing something special to play. Or, you could walk them through the chord chart of their favourite popular song. You could help them find and learn a piano tutorial on YouTube. As their teacher, you’ll be able to vet the tutorials and help them find the best, and most pedagogically sound one. Now that we have some good ideas about what your student might be working towards, let’s think of ways your student could earn one of these rewards. Since some of these experiences require an investment of time and/or money, I’d save them as long-term goals. Things like a party, a field trip or a recording opportunity are all experiences that you’ll want to create a lot of anticipation for. In these cases, you’ll probably want to schedule them at least a few months in advance and have students working towards their goal of earning that opportunity for a couple of months, part of the school year or even all of the school year. Students could earn these experiences by tracking the number of days they practiced, the amount of time they practiced (and how effective it was), the number of songs they learned, the number of pages they learned, the number of measures they learned. You could create a simple chart that each student would keep in their assignment book to track whichever metric you choose. I also recommend keeping a larger chart on your studio wall that students can update at their lesson each week. This will help create the buzz about the reward that will take your students’ motivation to the next level. Students love keeping tabs on how everyone is doing and taking note of what they need to do in order to blast ahead of their peers. Shorter term goals work well if students are earning privileges or something that doesn’t require a lot of planning on your part. For these rewards, you could have your students practice for 21 consecutive days, or master certain difficult sections of a piece. Or you could host a month-long challenge and reward the top five students with special privileges. You could challenge your students to practice for 25 out of the 30 days leading up to your recital. Anyone who practiced 25 or more days gets to play games at their lesson after the recital. You can find Megan’s website here for more of her piano teaching thoughts. While rewards and incentives aren’t for everyone, sometimes they’re just what a student needs. In my studio, I always have a handful of students who seem uninterested in the incentive, while many others really take them seriously. It’s the students who take it seriously that really make it worth it. I’ve seen a 30-day challenge within my studio propel a student to practice every single day for the rest of the school year. 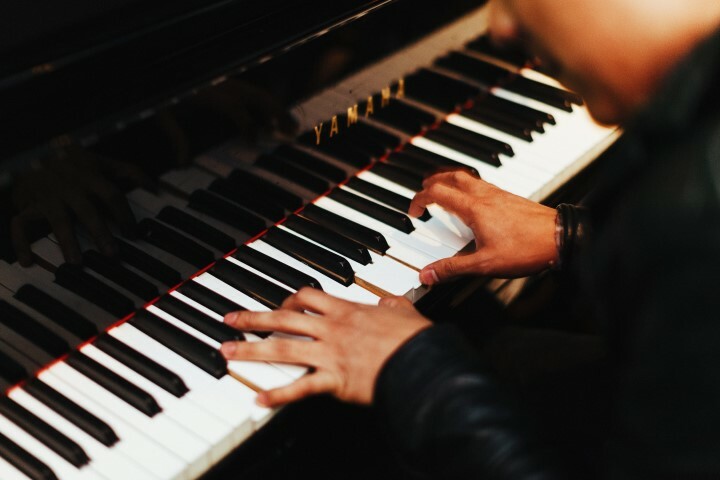 Sometimes the motivation of a reward at the end of the school year is what helps a student develop that day-in and day-out discipline that helps their piano skills really take off. Leave a comment and tell us about your experience with non-material rewards. Have you tried any in your studio? How did your students respond? Did any of your students really take off thanks to a challenge? Looking for more help? 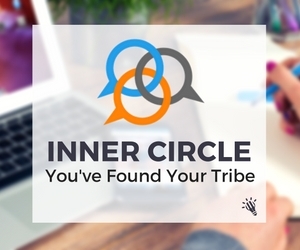 If you’re feeling lost and without direction in your studio, are feeling burnt out or unsure of how to grow your studio, or are just looking for some help in your studio, come and join us in the Inner Circle. Megan Desmarais runs a dynamic piano studio in Tulsa, Oklahoma, USA where she helps students from ages 0-70 to succeed with and to love music. She blogs at verypiano.com where she loves to share resources and ideas with teachers and learners of piano. Megan recently created Teach Preschool Music, a comprehensive online course for piano teachers who wish to add a preschool music program to their studio. Megan enjoys spending time with her husband and 2 kids, playing violin in a community orchestra and learning new things.